Some evenings, when sleep is slow to come, I watch the show “Naked and Afraid.” If you aren’t familiar with the show’s premise, it pairs up an adventurous man and woman who have never met before and drops them off into the hostile wilderness for 21 days. They are removed of clothes and personal belongings and left to fend for themselves. There is, of course, an element of phoniness to the whole thing, as medics and camera crewmen are never more than a few steps away. Still, the editing, which focuses largely on the snakes (vegetarians, avert your eyes) they often eat and on the ruggedness of the terrain, makes for a thrilling hour of reality television. A recent episode found the protagonists in a rural swath of Nicaraguan jungle. Humidity was in the high double digits and there was an even larger presence of venomous snakes than normal, but of course our heroes survived their ordeal, dirtier and skinnier but otherwise little worse for wear. The episode reminded me of my recent trip to Nicaragua, a country about which I have not written nearly enough aside from a single photo gallery in late January. 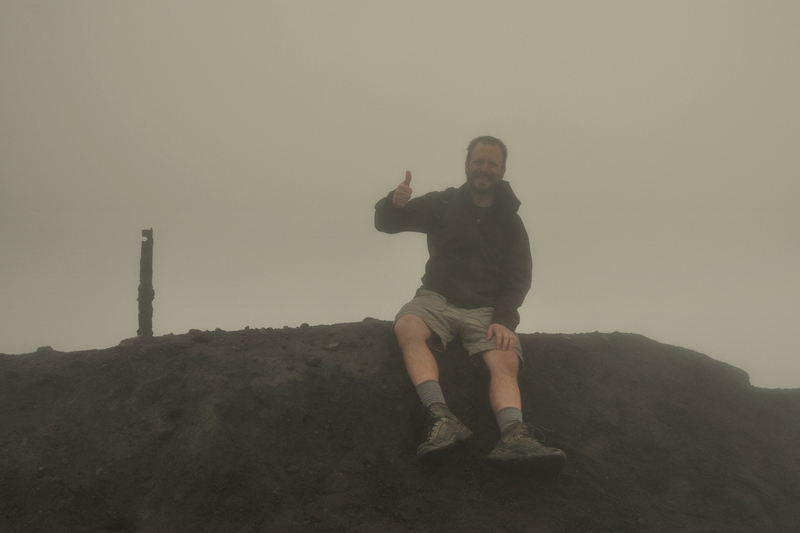 In particular, watching the participants navigate steep slopes and contend with ankle-twisting tree root “stairs” recalled the vigorous 12 hours during which time I successfully climbed Concepción, at 5,282 feet/1,610 meters the country’s second-highest volcano. Isla de Ometepe, an aerial photo of which could accompany the definition of the traveler’s phrase “nothing else like it in the world,” is a figure eight-shaped island in the middle of Lago de Nicaragua, Central America’s largest lake and the reputed home of legendary (and never-seen) freshwater sharks. 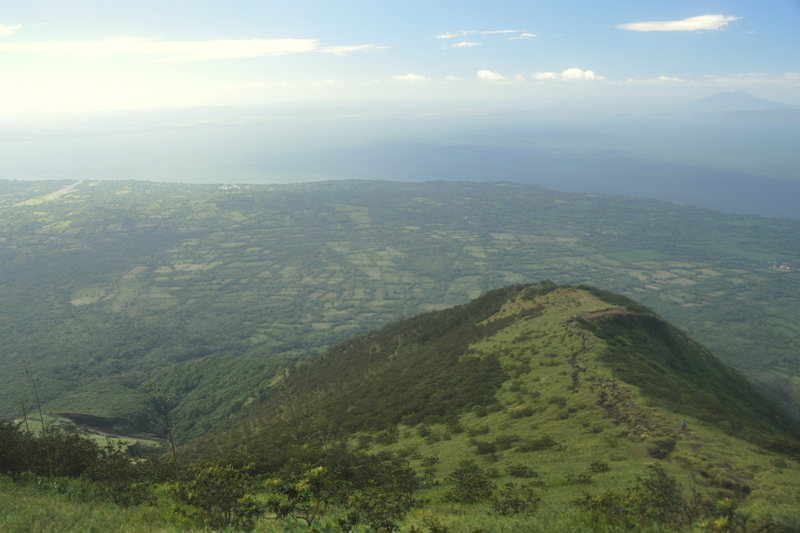 Each loop in the figure eight shape is dominated by a massive, still-active volcano, its slopes covered in lush green rainforest until halfway up, after which point the only elements aside from the occasional shrub are rocky, car-sized boulders. I looked down from an airplane window once while on a flight to Colombia and saw the island far below, and told myself that I simply *had* to go there sometime. Alas, it is one of my bigger photographic regrets that I never snapped a shot or two of Ometepe from the airplane, because even though I spent four days there this past January, it never came out of complete cloud cover. On the other hand, it is said that mountains make their own weather, and perhaps the cloud cover makes for a better picture. What do you think? 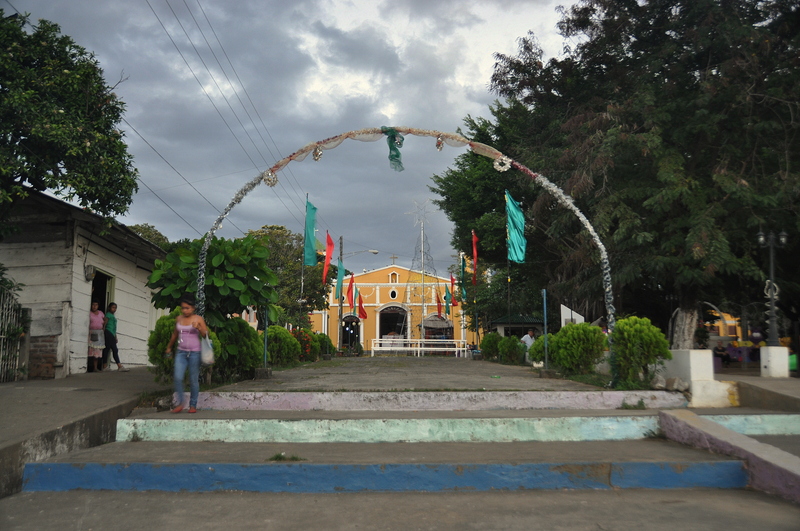 The one-hour ferry from the lakeside town of San Jorge deposited me at the sleepy one-horse town of Moyogalpa, and, after checking into Hotel Ometepetl, less than two blocks inland from the ferry terminal, I set out to book my guide (solo climbs are not allowed). My hotel, incidentally, was a nice place to stay, a step up from my Granada hostel but cheap and fitted with hammocks, over-sized sofas, and a pool that doubled as a gathering spot for local teens to make out. U.S. dollars are so commonly accepted in Nicaragua that, despite my having withdrawn ten days’ worth of moneda nacional, locals always quoted prices to me in dollars, which I then had to convert back into córdobas. 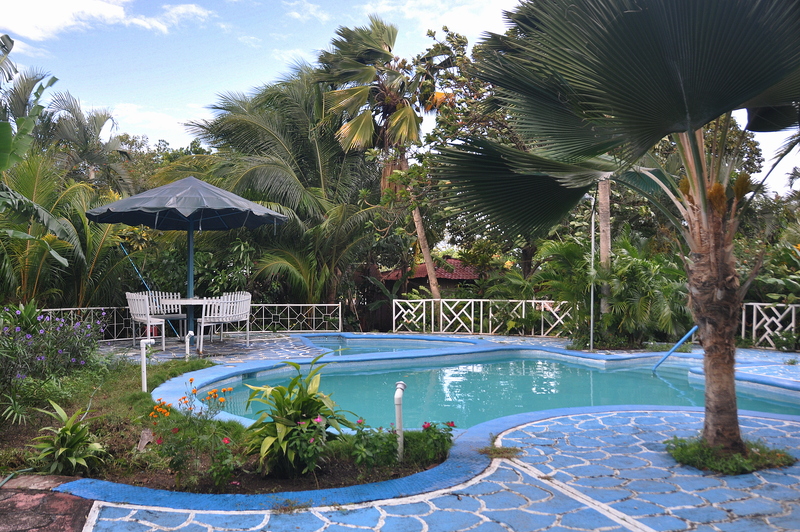 Ometepe subsists almost exclusively on tourism, so there were no fewer than four booking agencies on Moyogalpa’s main road. I simply stopped at the first one I came to and asked if they had any room on the next morning’s hike. “English or Spanish guide?” I was asked, and chose English. “We don’t have any English guides, güero.” Okay, so why did you even ask? But I digress. I was told that the normal price for a solo hiker with a Spanish guide was $25 USD, but that I could pay just $22 if I agreed to join another solo hiker who had booked a spot just a few hours earlier. I agreed, and was given a list of packing essentials before being told to meet the guide in front of the booking agency the next morning at, IIRC, 4:30 a.m. I set out to stock up on bottled water and energy food. I bought an apple, granola, cookies, and jerky, then returned to my hotel for a swim, relieved to find that the promiscuous local teens had finally packed it in for the day. I often find that when faced with an early wake-up for something exciting, I am so nervous about oversleeping that I simply toss and turn and never really fall asleep. That night was no exception, and 4:30 came way too early. The booking agent flagged me down (I was so sleepy that I literally walked right past the offices!) and served me coffee, which to me is the real nectar of the gods. I was wearing convertible shorts, a windbreaker, Lowa boots and REI socks, and immediately felt overdressed when the other hiker, a Brit whose name escapes me (we’ll call him “Nigel”) showed up, wearing Umbros, cross-trainers, and a tank-top. I was about to start on my second cup of coffee when our transport to the trailhead, a yellow U.S. schoolbus that was re-purposed as Nicaraguan public transport and fitted with a belching muffler, arrived. It was just Nigel, myself, and a local, craggy-faced abuelita on board until our guide, Bernal, boarded further along the road. We alighted a few kilometers up the road, posed for the requisite trailhead picture, then hit the trail. The sun started rising within minutes, and it wasn’t long before I found myself shedding my windbreaker. The first mile or two of trail is level as it passes a horse pasture on the left and a ranger station on the right. 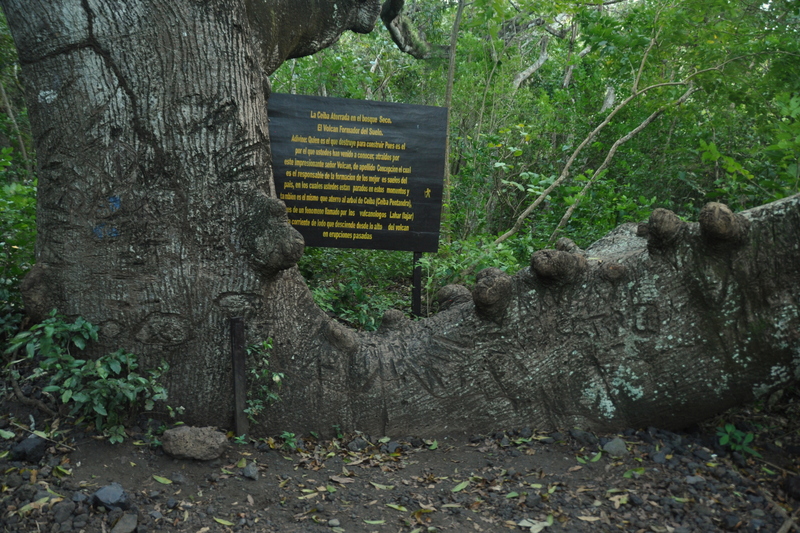 I wish I had hiked slower to savor the grade, because once we began our ascent, not far beyond an enormous ceiba tree, things got really bad, really quickly. By that I mean that my days as a fit hiker had long since passed me by. 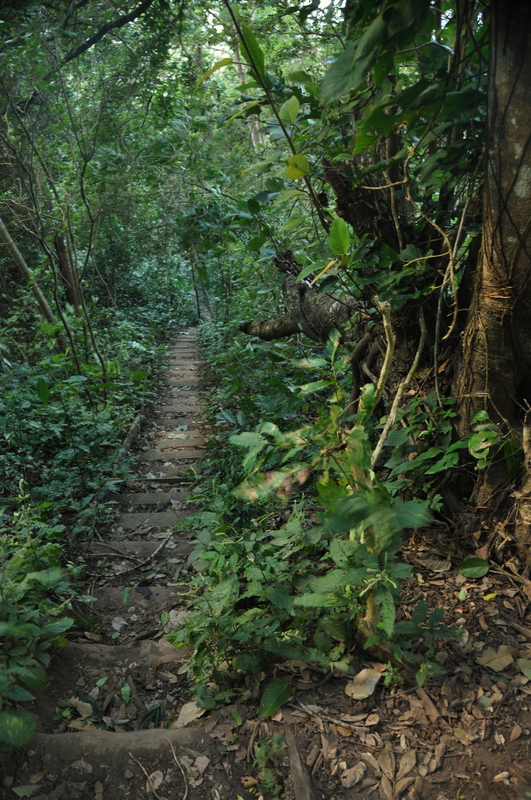 I was exhausted and drenched with sweat in no time, and the terrain was so steep that every step over tree roots seemed the equivalent of climbing three stair risers at a time. It was beautiful, though, and a series of placards were mounted at various stages along the trail to identify the flora and fauna of that particular ecosystem. 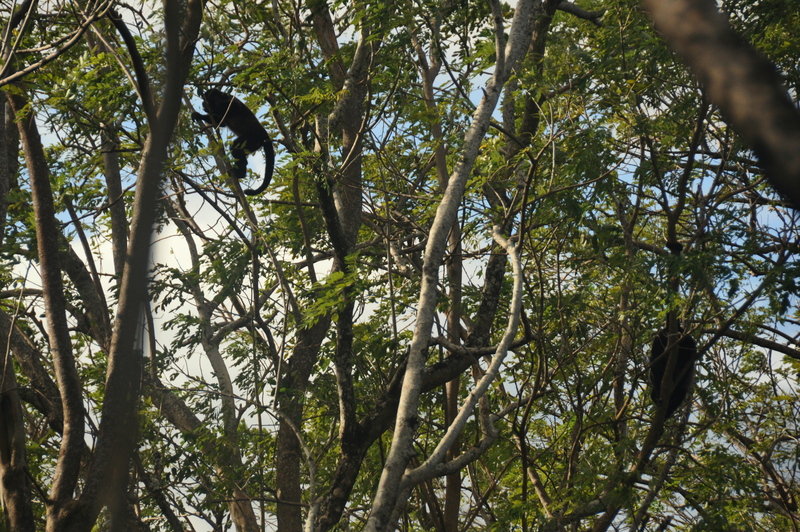 We lingered beneath a pair of howler monkeys for a bit, and I remembered from previous travels how difficult it is photographing tree-dwellers in the wild. We played leapfrog with a few other groups of hikers until, finally, the trail crested at treeline. We emerged into low-hanging clouds and sat alongside a thicket of trees to eat. I was alarmed to discover that neither Bernal nor Nigel had packed any food, and found myself sharing my wares with them. Although all was calm behind that thicket of trees, the saddle immediately beyond it, with clouds so thick one could barely see ten yards, was a fury of howling winds. I stood up and had to crouch low just to keep from being blown off the mountain. The gathering crowd grew larger as people debated whether to go back. A few went on, disappearing into the mist, but most turned back. We were going to turn back until Nigel caught a burst of summit fever. As a group we decided to push forward, making (but probably not committing to) the vow that we would turn back if things got worse. SPOILER ALERT: We made it to the top. That being said, the seemingly endless slog up, and then back down, was the hardest physical activity I’ve done in my life. One highlight, perhaps 200 vertical feet from the summit, was finding a fumarole in the side of the rock. The smell of sulfur was overpowering, the rock was warm to the touch, and you could both feel and hear the steam venting from the hole. 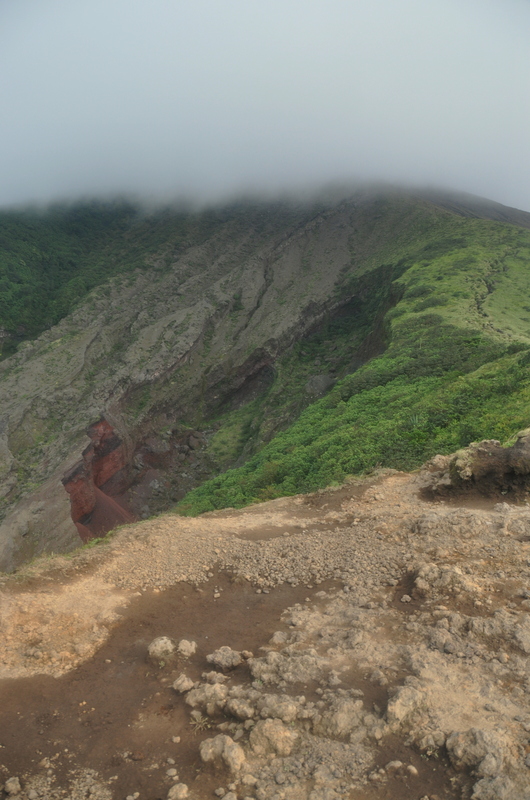 We finally reached to the top, a crater rim that sloped precariously inward towards the center of the volcano. As such, there wasn’t much room for safe posing; the wind and clouds made it unwise to linger for very long anyway. I had Nigel snap a picture of me, and, after returning the favor, headed back. I am one of those hikers who believes, crazy though it may seem to the non-hiker, that the uphill hike is good for the heart while the downhill hike is merely bad for the knees. 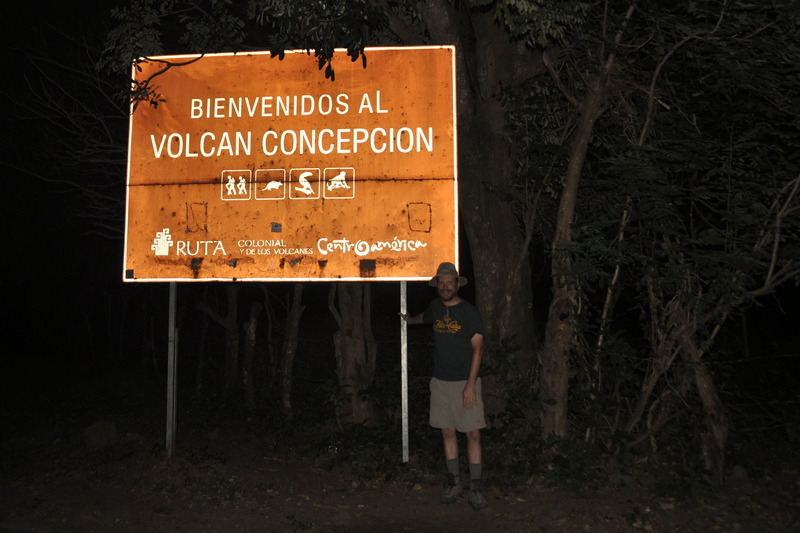 This reality check was never more apparent than while descending Volcán Concepción. Every step hurt. I fell once and slipped twice. Years of hiking and climbing in California have wreaked gradual havoc upon my right knee, and I wasn’t the least bit surprised to find a large group of Canadian high schoolers, a few of whom I had struck up a conversation with on the ferry ride the day prior, passing me on the descent even though they reached the top a full hour after I did! Even Nigel, who complained more than once during the hike of knee pain, grew tired of my slow progress. Once we passed the windy saddle and were in the relative safety of the rainforest, he took off at his own pace. I never saw him again. In some ways, the rainforest was the hardest part of the hike. There wasn’t any slick rock, but those dreaded tree root steps were misery. It rained during this section, which turned the trail into a mud slick. The skies were overcast for almost the entire hike, and it seems strange, even surreal, that the only time the sun actually shone through the clouds was while the rain was falling! Speaking of cloud cover, I should sidebar for a bit to talk about the view – what I saw and what I should have seen. 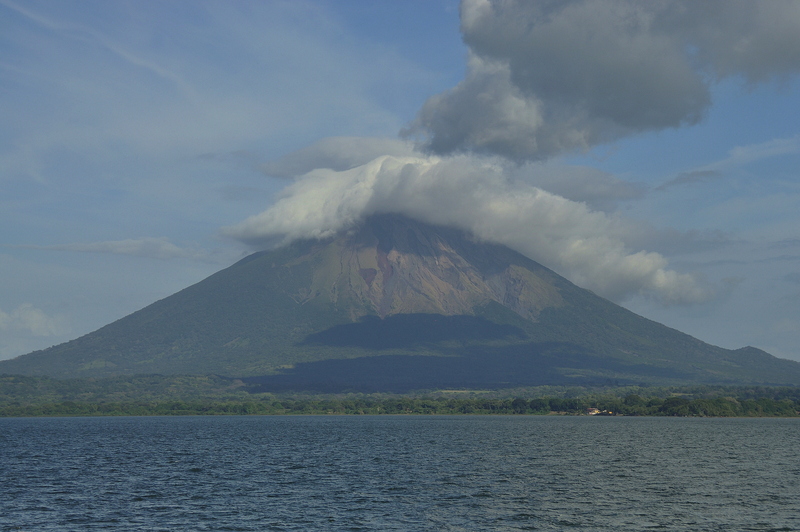 The isthmus that is Central America is at its second-narrowest point in southern Nicaragua, and Lago de Nicaragua rests within 40 miles of the Pacific on the west and the Atlantic/Caribbean on the east. I met a traveler on the bus from Managua to Granada who told me that he once rode his motorbike from Oregon to Panama, and that one of his best memories was standing atop Concepción and seeing both oceans from its summit. Although he insisted that this was the only place in Central America that offered such a view, I cannot help but wonder if Volcán Barú, Panama’s highest peak at 11,398 feet/3,474 meters and more than twice as high as Concepción, does not offer a similar view. Either way…I didn’t get to see the view that I had paid for, but the lower-level clouds lifted for a few minutes during my descent, offering me the following view of western Ometepe. If you look closely you’ll even see the single-runway airport that connects Ometepe with the rest of Nicaragua on those few days when the ferries don’t run. 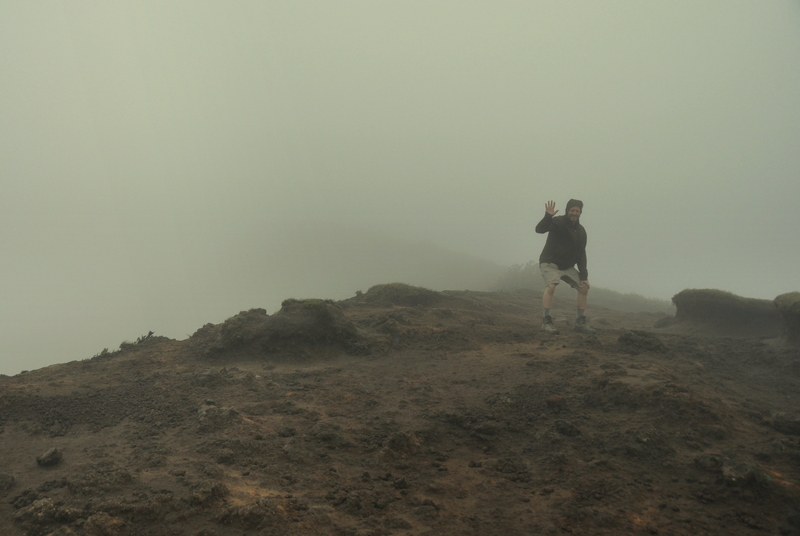 By the time I reached the trailhead at the end of my hike, the clouds had lowered once again and the upper reaches of the peak, along with that of lower Volcán Maderas, on the other side of the island, were obscured once more…and remained so for the rest of my time on the island. Although safety is always the top concern when hiking, I was nevertheless embarrassed by how long it took me to complete the hike. Well, “disappointed” is a better word. Bernal and I had missed the last bus back to the town, and I had fun watching chickens and pigs frolic while we waited for a moto-taxi, which took us to the booking office. The travel agent had my change from the previous day’s payment waiting for me, and I told her to give it to Bernal instead as a tip for his services. Truth be told, he wasn’t much of a guide; he barely spoke a word despite my efforts to practice my Spanish with him. As I wrote a few paragraphs earlier, he didn’t even pack any food! When I arrived at my hotel, my room light wasn’t working and I thought the bulb needed changing. Turns out there was a power outage across the entire island. Most of the restaurants in town were of the pizza-and-beer variety, and the few with gas cooking ovens attracted the majority of Moyogalpa’s travelers. None of the refrigerators were working, though, so the beer was warm. I went to bed early, hoping to catch the 6 a.m. ferry back to San Jorge; when I awoke the next morning the power was still out. 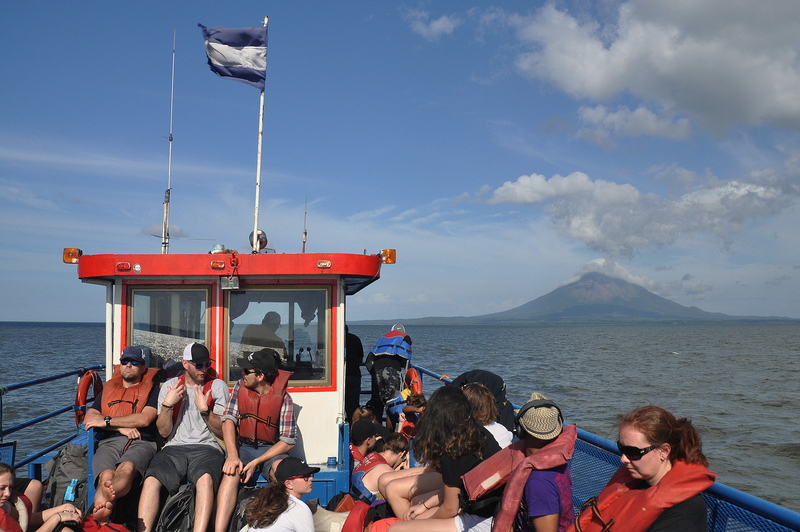 Being stranded on Isla de Ometepe ultimately resulted in my being two days late getting home. Everything worked out fine in the end, and my rescheduled flight was actually less expensive than my original flight, even after factoring in the requisite rebooking fee! When I returned to work, more tired from my vacation than I was from the job itself, I was told by my manager that his boss wanted him to write me up for absenteeism. That, really, was the beginning of the end, and I left the job just one month later. But alas, that’s a story for another time. 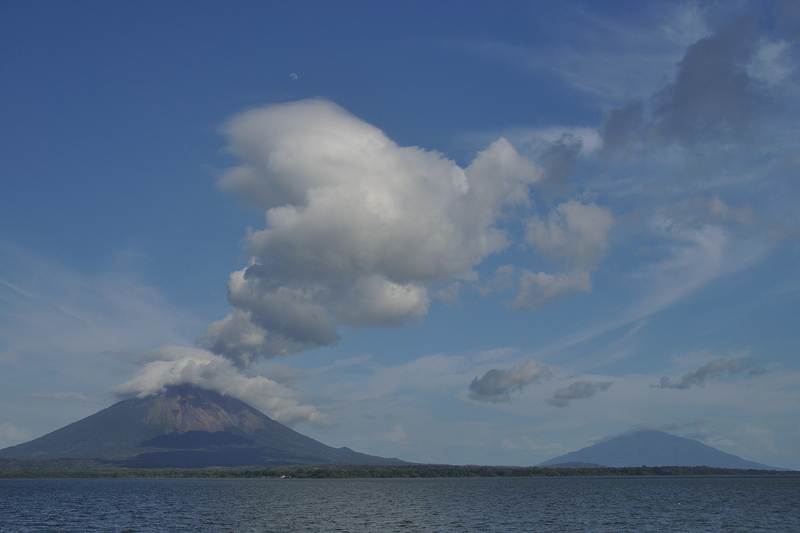 Isla de Ometepe is a strange and wonderful place. Its airport runway actually crosses the island’s main loop road, which means that planes sometimes have to break suddenly to avoid crashing into passing cars. Its beaches, which are of the black sand variety, are more rugged than tropical, and are sometimes inundated with sandflies. Its ferries are fast and frequent, yet unreliable. 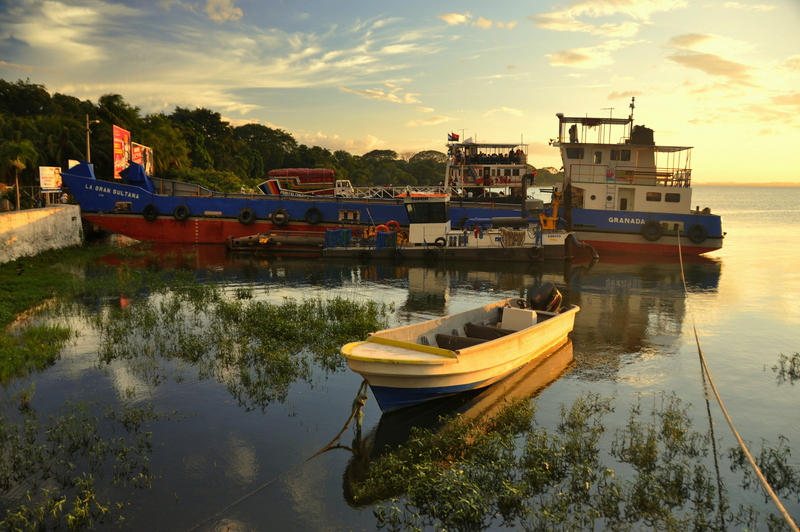 Its sunsets are magical, as the sun disappears beyond a horizon line dotted with reeds and fishing boats. Its infrastructure is sorely lacking, especially during what turned out to be a three-day power outage that had me wondering if some sort of coup d’état had taken place on the mainland. Its hiking trails, particularly the Moyogalpa approach to Volcán Concepción, with ankle-busting boulder hopping, gale-force winds, and Mordor-esque cloud cover, will test even the fittest hiker…while subduing him or her with lush, you-are-there scenery. Would I do the hike again? Probably not; my legs ached for weeks afterwards. I think I’d prefer to climb neighboring Volcán Maderas, which is several hundred feet shorter in elevation, and which is said to have a crater lake on its summit. Either way, I can’t help but file the experience alongside many of my other best travel memories: something uniquely, incredibly of the moment.